It’s that time of year again when everything begins to drop; from the snowflakes to pinecones and leaves. So why not take advantage of it? 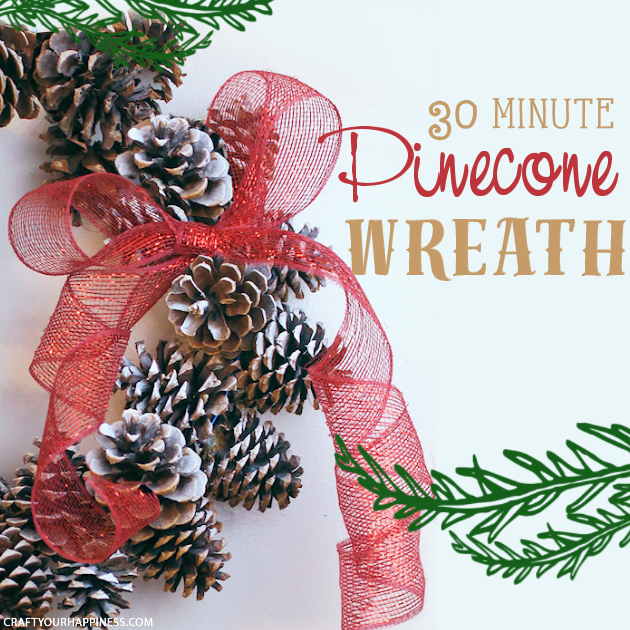 Gather up some pinecones and put together this darling pinecone wreath in as little as 30 minutes using only 3 supplies. 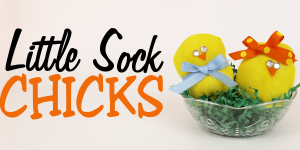 It’s a great way to add some seasonal decor to your home while not breaking the bank. 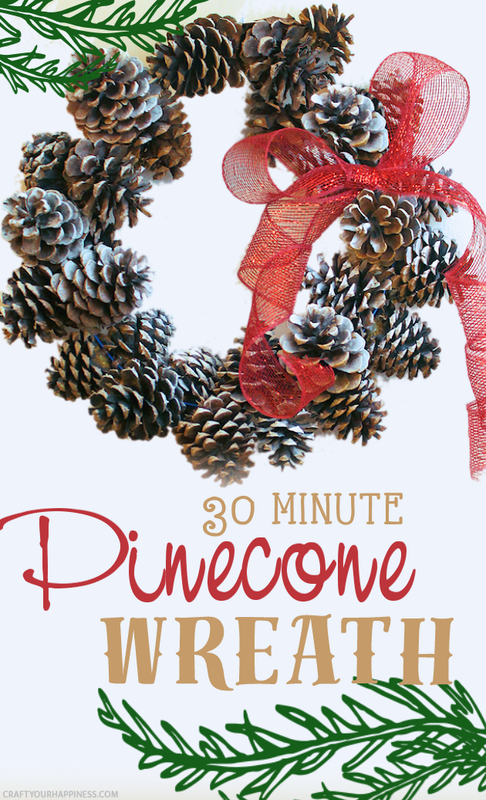 We’ll give you the step by step instructions with photos on how to make a pinecone wreath. 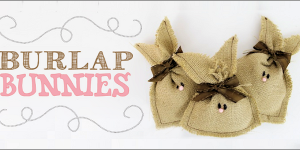 If you like this make sure to check out our Christmas category which has more awesome ideas such as How to Make a Burlap Christmas Tree or How to Make Poinsettia Lights Garland using tissue paper and twinkle lights! NOTE: These are best stored in even temperature areas. 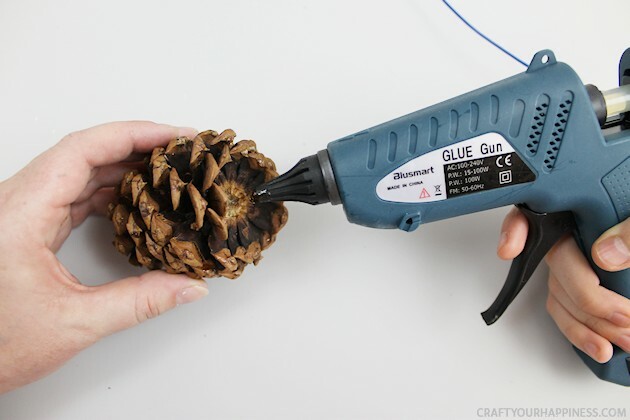 If it gets very hot the hot glue might pop off from the pinecones. Pine cones, we used approx. 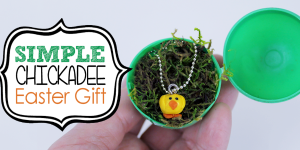 3″ or 4″ inch size and it took 25. How many you need depends on the size of the pinecone. Larger pinecones will not work well. White Spray paint, for snow effect. Brown paint for hanger (OPTIONAL) This is in case any of it shows through but if done right it should not. 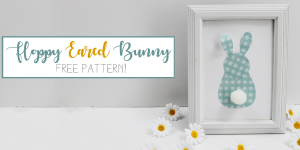 Pony beads – You will need one bead per pinecone. We used brown but black or clear would work. Ribbon or anything else you wish to decorate it with. We used a red 2.5″ ribbon that had sparkles on it. 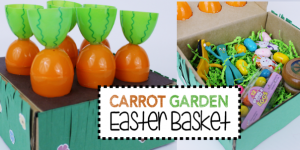 Heat up your glue gun and gather your supplies! 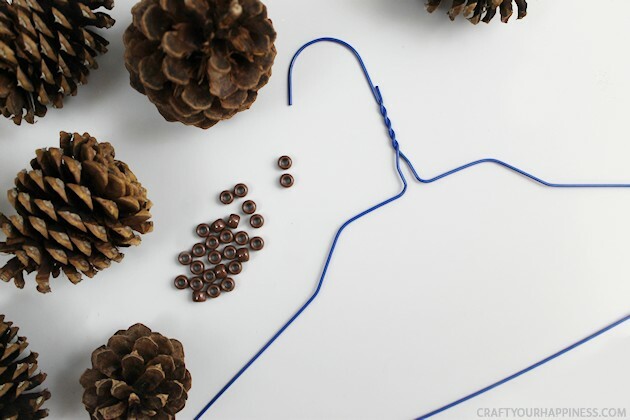 Once the hanger is in shape, set aside. 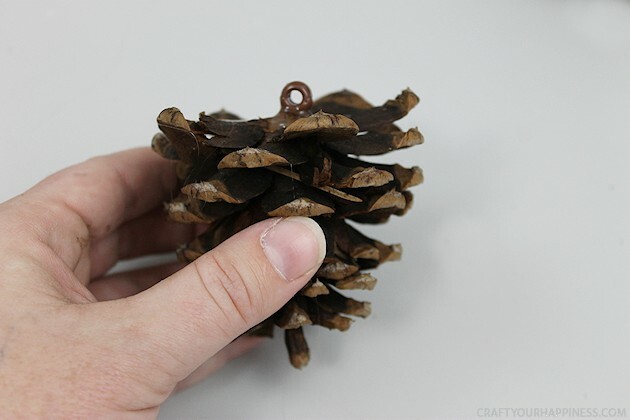 Grab your pine cones and begin by placing a generous blob of hot glue on the base of the pine cone. 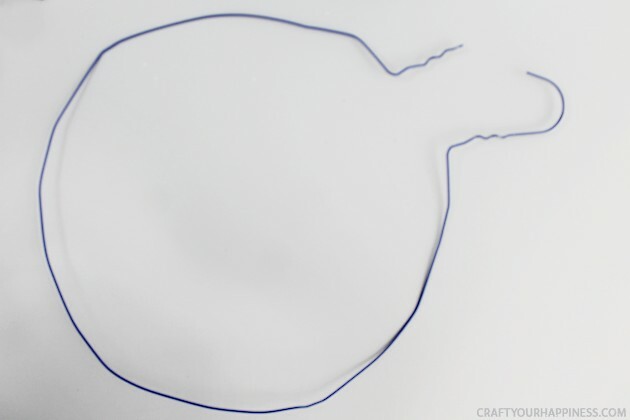 Place a single pony bead, side-down, into the hot glue. Hold in place until set. 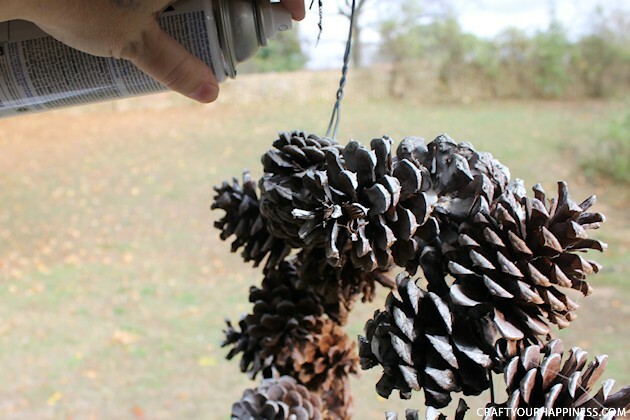 Once it begins to dry, set aside as you complete the other pine cones. 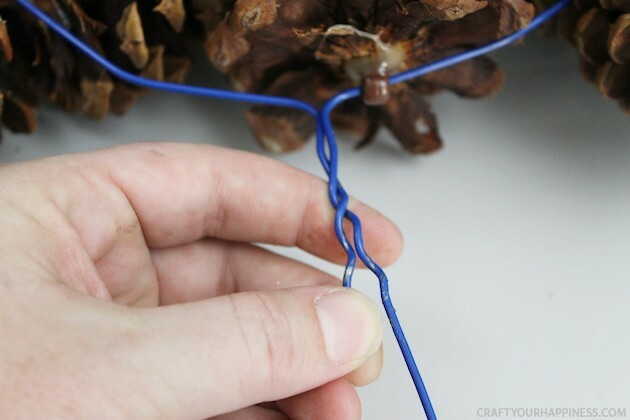 Once the beads are all attached to the pine cones, begin threading the wire hanger through the pony beads until it is completely full of pine cones. 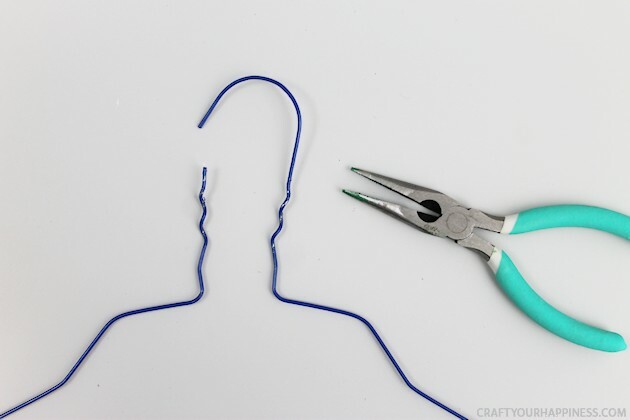 Once full, twist the tops of the coat hanger back together. 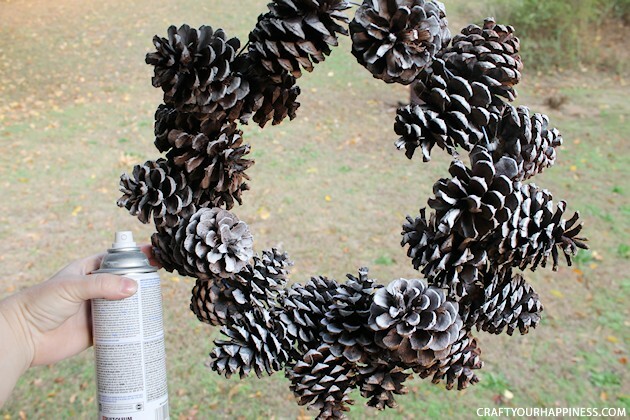 At this point you can decorate your wreath or opt for a more ‘wintery’ look by adding some white spray paint. We chose to lighten it up a bit using a basic white gloss spray paint we had lying around. 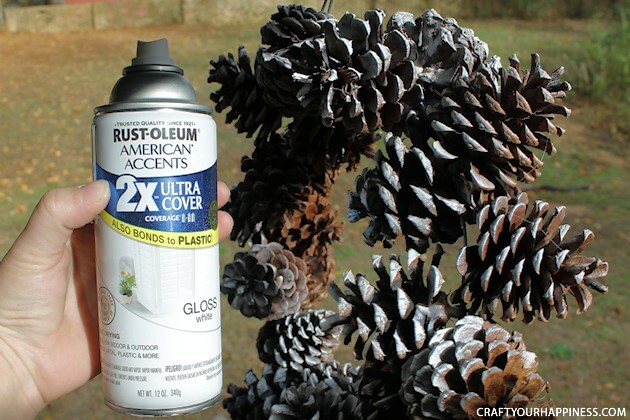 Simply hang the wreath outdoors and spray downward onto the wreath, hitting the tops of the pine cones with the white spray paint. Once dry, take indoors and add the holiday decor of your choice. 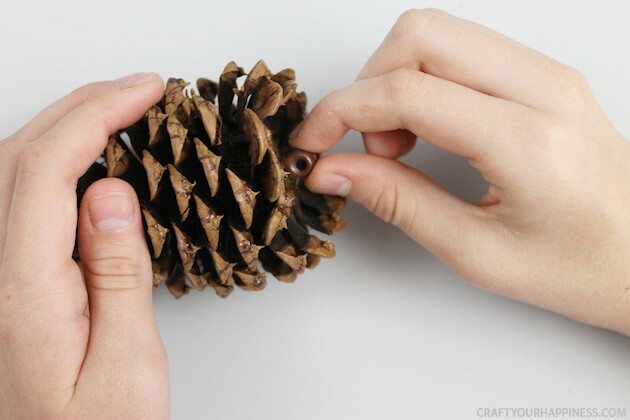 Since the pine cones are attached using pony beads, you can easily rotate them around to get the exact shape and look that you are going for. This looks really easy, and fun. Can’t wait to get my hands on some pinecones and ponybeads. Really cute idea. I have done this type of wreath with (plastic) Christmas ball. Love these decorations! Thank you! Well thank you. Excuse me while I walk around with a big head for a little bit. Ü Appreciate the visit Sherry! Don’t store your wreath in the attic. Problem solved. I live in Arkansas… hot AND humid during summer. I have trouble even in my house with things I’ve used double sided tape on falling off the walls. Not a fan of humidity especially when it messes with my stuff! 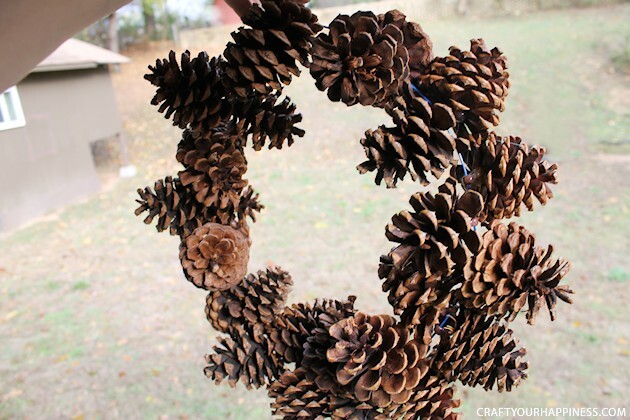 This is a lovely and clever way to use pinecones on a wreath! Fantastic job!!!!! Thank you Pat and thanks so much for stopping by! If this wreath gets stored in an attic in an area of the country that has extremes of hot and cold weather (20s to 90s…much of the country…but actually I think its the extreme cold…the glue contracts and the ornament pops off) you’ll find that the hot glue will not hold, and many pieces will have to be repeatedly reglued every year. Better to find a different glue that will hold up to the extremes. That’s actually a very good point. I’m going to add that bit of info to the post. Thanks Kate! I actually found industrial-strength glue sticks by the box instead of using craft glue sticks as I had the same problem with homemade items that didn’t hold up in storage too…. the heavy-duty glue sticks have lasted me six years now they’re completely Opaque whte. not translucent like the ones you buy for your hot glue gun at the craft store… I’m sorry I don’t have a brand-name but they were from Home Hardware, (half the size of a Kleenex box ) for $10 …..maybe 50 to 100 5″ sticks per box. they look like Elmers white glue but dry clear and I’ve held up on all my pinecones and acorns really really well I’m a set designer and it’s the only kind we use at work because glue guns are a staple tool and they have to hold up to the hot lights. 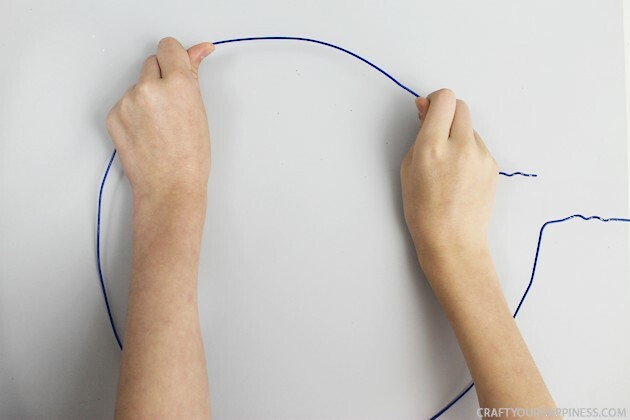 Great post by the way thank you for an excellent idea instead of drilling holes and hot glueing hooks !! Wow! The pony beads are such a clever way to use on pine cones!!! Sorry, this amateur gets very excited to learn a new trick! !merry Christmas! Thanks for such a great idea! That you Elsa. I’m the same way when I see something I’ve never thought of. Thanks for visiting and Merry Christmas back at ya! So, I immediately ordered some shiny tortoise color pony beads and a ton of long pine cones! Half I left in their natural state and half I sprayed with gold. Then I spent hours gluing the beads, (about 300!) 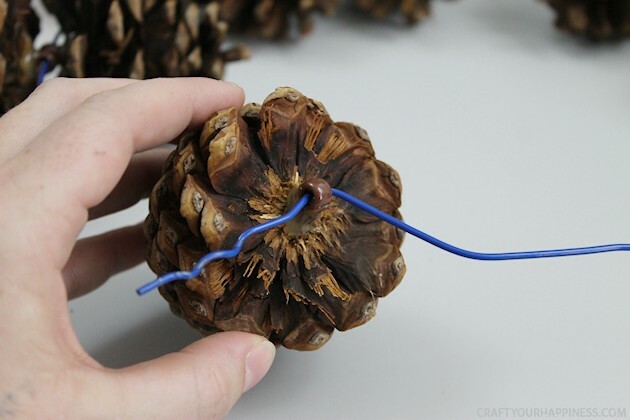 so that I can hang the pine cones very close to the branches of my Christmas tree with fishline. Having recently moved to a house, with acres of mature oak trees, (and not finding all my Christma boxes), I will decorate a gorgeous cypress tree, 16 feet tall and about 8 wide, with nothing but the beautiful long pine cones, and lights. The pine cones are so beautiful, and the beads look like a part of the pine cones themselves!. 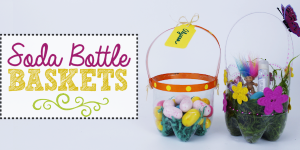 Did I mention that I LOVED this idea?! And, you, too, Nancy! Thank you again! It sure would. Thanks for bringing it up and for visiting us!